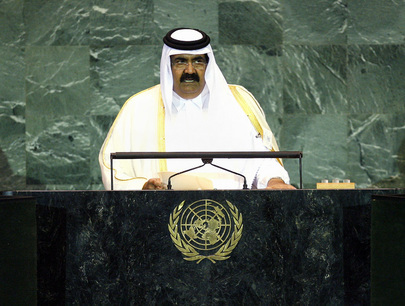 SHEIKH HAMAD BIN KHALIFA AL-THANI, Amir of Qatar, said the current General Assembly coincided with an extremely special international situation; one that took place at “critical junctions of major historical developments”. That had given rise to the opportunity to regulate international interactions and systems. Those opportunities were a “pre-renewal” for a new future, especially after the financial market crisis, 11 September 2001 and other events. He urged that the United Nations system needed quick renewal and strengthening of its institutions so that it conformed to the new realities of the world. Global events had altered the world map, changed the balance of power, and had also generated a “renewal-seeking movement” in the United States that “we are all following with interest”. He added that the international community had become “confused”, and it was now clear that peace and prosperity required more than bi-polarity or the hegemony of one country, no matter how advanced that country was. “It is clear that the serious crises of the world were exacerbated when nations and the international order tried to tackle issues not from the United Nations framework but from another setting.” The situation in the Middle East was one of those issues. Highlighting the contribution that small States could make on issues, he said that although the sizes of States were not equal that “it is time to go back to the United Nations system that accommodates everyone and is a venue recommended by all and a charter accepted by all nations of the earth”. It was necessary to use the United Nations to solve intractable crises with a legitimate international consensus. Turning to the issue of energy, he highlighted Qatar’s involvement with energy alternatives, its concern with global climate change and the impact of that phenomenon on the environment and life on planet. Moreover, there could not be peace or prosperity when there was an energy crisis. He thanked Secretary General Ban Ki-moon for his United Nations Summit on Climate Change, which was a forum to discuss the issue’s serious threats. He said it was the duty of the international community to respond to these new challenges. Finally, he noted that Qatar’s North Field has made that country the world’s third largest producer of natural gas; consumption of which was less harmful to the environment. Thus, the Government of Qatar was promoting its use, as well as encouraging efficiency using other forms of alternative energy such as solar power.